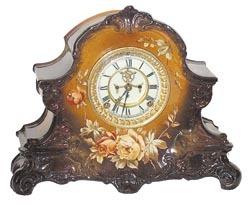 Ansonia Clock Co., Royal Bonn case, "La Nord", ca 1904. This is an outstanding Royal Bonn case in colors I have never seen before, dark chocolate browns, yellow roses, and more unusual no gold gilt. The case is perfect. Bezel, dial, hands, open escapement movement, all are perfect. This clock came with the Miller collection. Case is 14 1/2 inches wide, 12 inches high. It should sell in the $1300-$1800 range. Ly-Ansonia No.2584.